APOLLO 11 MOON LANDING ON CROSSCURRENTS, 7/20 – Doggedly Yours… Howling, Humor, and History. APOLLO 11 MOON LANDING ON CROSSCURRENTS, 7/20: It was “one giant leap for mankind” when a human for the first time walked upon the lunar surface on this date in 1969. 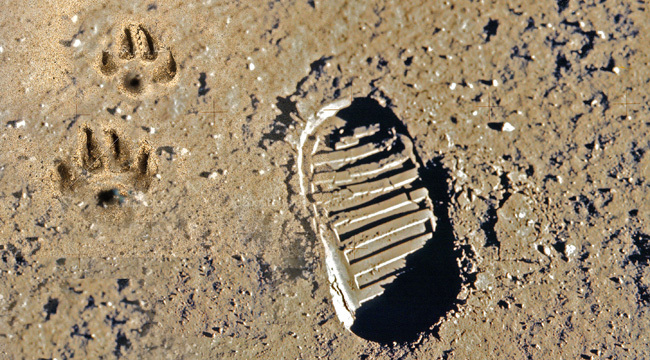 Gavin and Wyatt have taken “one small step for man” (and dog) alongside Neil Armstrong’s boot print. You are invited to celebrate the Apollo 11 moon mission by joining John in the Eagle lunar lander and tuning in Crosscurrents, 7/20 at 8 a.m.